Mobilgas Pegasus sign for sale at Caplan’s Auction Jan. 21, 2018. My hunt for the mythical creature had been unsuccessful for years. I knew one had to be out there somewhere with my name on it but month after month, year after year, I simply could not find the famous flying horse. The equally famous “American Pickers” seem to be magnets for them on TV but not me. House after house, outbuilding after outbuilding, storage unit after storage unit, I remained unfulfilled — our Maryland/Virginia/DC estate liquidation company’s resume seemingly incomplete. Then the phone rang last week. A friend told me that he had spotted my quarry in a most unexpected place — a white-glove-clean new Virginia home. He sent photos confirming his vision was not a mirage. My heart raced but I fought the urge to let my hopes soar to the heavens. That’s exactly where they went, though, when I raced to the owner’s home. 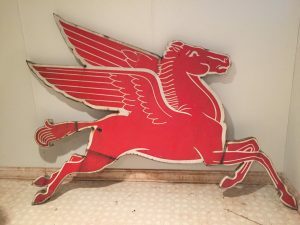 I could barely believe my eyes or my sensory perceptions as I reached out and touched it … a large, vintage red Mobilgas Pegasus sign with cookie cutter back. It stands about 5.5 to 6 feet tall by 6 to 8 feet wide. (I’ll report the exact dimensions here soon.) The owner was at long last ready to sell as there is no room for a giant flying horse in the smaller home he and his wife are moving into. what I knew would be profitable for Orion’s Attic. I turned to my favorite strategy. The bearded charmer Frank Fritz gets excited when he’s able to bundle several items together. I’m a beardless charmer who likes to bundle truckloads together. The couple was nice enough to show me other items they were interested in selling — a nearly 200-year-old dry sink, antique blanket chest, antique wood ice box, a small Mobilgas Pegasus sign, a pair of small Socony signs, some modern Mobilgas toy vehicles and more. I struck a deal everyone could live with. I was so elated that endorphins censored the strain of the back-breaking work the mega-bundle required. One of my staffers and I lugged each piece out of a basement, down cement patio stairs, around the side of the house, up a snow-covered hill that felt Mt. Everest and lifted them ever-so-gently into our truck. I made the long drive back to Silver Spring, Maryland feeling as if I had finally graduated from antiques and collectibles university. Despite all the sales Orion’s Attic has racked up over the years, we have never handled a Mobilgas Pegasus sign. I quickly reached out to my friend John Harris, the owner of Caplan’s Auction, in Savage, Maryland. We decided to team up on the sale of the big flying horse and the great antiques. 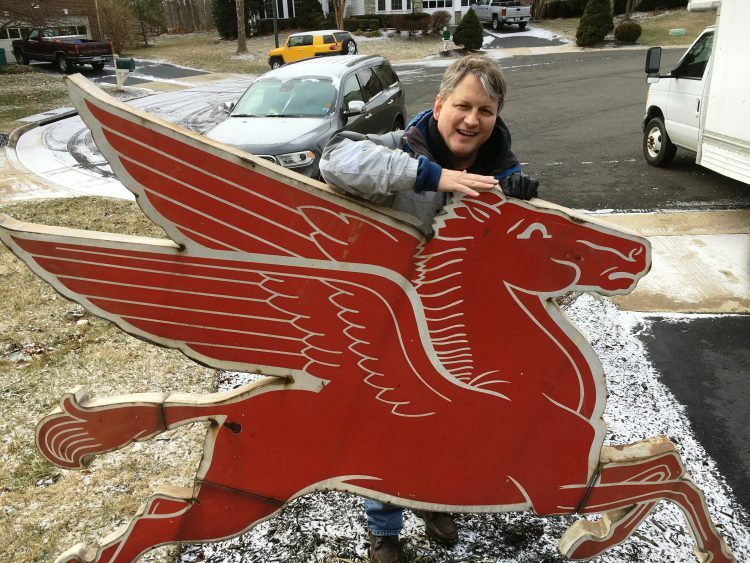 The Mobilgas Pegasus sign will hit the blocks Sunday January 21, 2018 at 4:30 p.m. Join the auction in person or call and leave a left bid if you have a way of taking care of pickup and shipping. The sign is quite heavy — 150 pounds if I had to guess. If you’re fortunate enough to place the winning bid, you will be taking home your little piece of history. I had to fight the temptation to keep the Mobilgas Pegasus sign for myself. It’s a common struggle for all antiques and collectibles dealers and estate liquidators. I normally at least like to foster parent my favorite pieces for longer than the scant 24 hours the sign lived with me. I’ll be sad to see it go but at least now I now know that the elusive flying horse is real! Need a Maryland or Virginia estate liquidation company to handle your family’s whole estate or special collections? 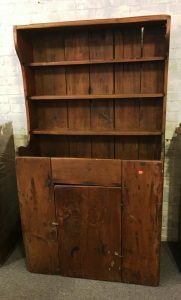 Contact Orion’s Attic today! We provide a “one call solves it all” solution for your estate needs including the sale of all items, facilitation of charitable donations and junk removal service.